My name is Crystal and I am a 40+ year old mother of 3 children (a son and beautiful twin daughters). On November of 2004 I was diagnosed with Secondary Progressive Multiple Sclerosis and Transverse Myelitis. I’m pretty sure it started when I was very little. After I was born June 2nd, 1967 I was diagnosed with Viral Meningitis and I had seizures and was on Phenobarbital up till I was 12-13 years old then I out grew it. I had been in and out of the hospital over the years throughout my childhood because of the seizures. I remember my Mom telling me she would say things to me to try to get my attention but it would take her a while. She also said that sometimes I would not remember things that she and others would tell me. While I was growing up I had gone to see many doctors regarding different symptoms and they would always tell me something different was wrong or that nothing was wrong with me and it was all in my head. Around 1998-1999 I started having symptoms that I couldn’t explain but all the Dr’s I went to kept telling me nothing was wrong with me, it was all in my head or I was having panic/anxiety attacks. One time I was having a lot of pressure in my head that I knew was not normal so my first husband took me to this Dr and he gave me these pills and said to take them and it would take the pressure away. So I took the pills for 2 weeks until I woke up one morning feeling really strange; like I was drifting away. I called my Mom and she told me to lay on the couch and I’d be ok. At that time I was getting no support from anyone in my family because they believed all the Dr’s that said it was all in my head. Anyway I just didn’t feel right and felt like I was dying so I called 911 and lucky I did or I would be dead right now. They came and my blood pressure and heart rate was so low they had to give me something in the ambulance to bring them back up and spent 2 days in the hospital. Well I found out that the Dr gave me blood pressure medication for pressure in my head. Moron!!! One morning I managed to get out of bed and made it to the living room and collapsed because my legs were totally numb. So my ex husband as of now took me up to the little hospital in town and they left me lying on a hospital bed for a few hours not doing any tests and then just sent me home. They did nothing and said nothing was wrong with me. I wasn’t even able to drive, but yet there was nothing wrong with me. Eventually, I started feeling better, driving and went back to work as a CNA in a Nursing Home for 2 years. Later I got a job at a small family owned office supply store to be there for my kids. I went through a bad divorce and after my divorce I was in 2 car accidents that were not my fault… Talk about stress…..
On March 20th, 2004, a year after moving to Florida, I got remarried. Eight months later I was diagnosed with SPMS and TM but after 2 years I divorced him because he wouldn’t work after I was diagnosed and wanted to live off my disability which wasn’t much. At the time I had been working for a brochure company driving a van to hotels and other places putting in brochures in the racks to keep them full. I was with them for almost a year before my diagnosis. My first symptom was feeling extremely tired all the time. When I got home from work I would have to lie down and take a nap which was unusual for me. Later I have read that tiredness is one of the first signs of MS and also the pressure in my head I was having. I then started having a lot of back and neck pain and then went numb from my feet up to my chest and could barely walk. I ended up working for a week driving a van and delivering brochures in this condition. I visited my family doctor and after explaining to him what was wrong he only asked for an x-ray and checked my lower back and of course he found nothing. So he quickly dismissed my symptoms to stress and too much physical activity. After months of this constant numbness and pain, I decided to go to a Chiropractor because I thought it was a pinched nerve. So I went and he did some x-rays and an MRI. The next day that doctor asked me to come in right away. That 10 minute drive to his office was the longest drive filled with fear and anxiety I’d ever felt. When I arrived for my results he told me he could not examine my back or carry out any procedures on my back because there is a mass in my spinal cord from the lumber region to my shoulder blades but he could not tell me if it was a tumor or just a mass and he had made an appointment with a Neurologist for the next day. These hours before the appointment with the Neurologist were the longest that me and my family had to endure at home wondering what was in store for me and us. The next morning at the Neurologist, I explained what symptoms I was having. He did some more tests in his office, and asked for another MRI with and without contrast (important to diagnose MS) and admitted me to the hospital to do a Lumbar Puncture (also important to have to diagnose MS). He ordered three days of Steroids through IV in the hospital and another week at home. A week later my Neurologist explained that after reviewing the symptoms I had complained about and reviewing my medical records he determined that I had Transverse Myelitis. Also he knew I had Multiple Sclerosis before he got the results of the Lumbar puncture and that MS had been present at other points in my life. He just needed the Lumbar puncture results for confirmation. When he told me I felt like I was in a bad dream. It felt like I hit a brick wall. My mind was numb and I didn’t want to believe what I was hearing. I was so devastated and all I thought about was that I would end up being a cripple the rest of my life and would have to depend on others to take care of me. I was scared to death!!! I sat my kids down and explained that I was sick. I tried to explain it in a way that they could understand for their age. They seemed to understand and didn’t say much but I know they were worried. I also told them that I wouldn’t be able to do a lot of stuff I was able to do before and they said they understood. My Neurologist started my treatment right away, which is essential in treating MS. He prescribed Betaseron injections, a medication for MS which is suppose to help slow down the progression of MS but what the Dr’s don’t tell you is it’s only suppose to help Relapsing Remitting MS (the 1st stage). I was on Betaseron for the first 8 months after my diagnoses, but it wasn’t helping me at all and just made me feel worse. I ended up getting a bad infection in my right upper thigh from the injections called Cellulitis. I was bedridden for 3 months during the summer of 2005. I ended up having to have surgery to drain all the fluid. It was the most painful thing I have ever felt in my whole life. My husband at the time had to help me up to the bathroom because I couldn’t walk by myself and I cried all the way there and all the way back because of the pain. In the next 8 months I went from using a walker, to a wheelchair to a Hoveround power chair. When I was bedridden with the infection I had done a lot of research online and found out about another medication that some MS people were using and it was helping them a lot. I started e-mailing with them and got all the information I could. The medication is called LDN (Low Dose Naltrexone) and it is a capsule you take every night between 9pm and 3am in low doses. I went to my Neurologist and asked him about it but he had never heard of it because it is still in studies and not been approved yet in low doses. I had printed a bunch of information about it and gave it to him and he said he would read through it and get back to me on it. A couple days later he called me and said it looked good and we could give it a try if I still wanted to and NO BAD SIDE EFFECTS. I said yes and he called it in. I started taking it on September 3rd, 2005. My understanding is that it can take up to a few months to get the full effect from LDN but I started feeling effects from it the very first night. Within taking LDN for about a month or two it didn’t even look like I had MS or TM. I started walking on my own and boy what a Great feeling that was. LDN had taken away my MS Hug, and helped me walk without a walker, wheelchair, or Hoveround power chair. It also helped with some of my back pain, muscle spasms, most of the numbness or tingling in my legs, and my swallowing problems. Another benefit was that I was no longer fatigued most of the time. LDN gave me back the ability to do a lot of things I never thought I’d be able to do again. Thank God!! LDN is not a cure but it slows or stops your progression and if your lucky your symptoms go away or lesson plus other benefits. Until there is a cure or something better comes out I will stick and stay with LDN. It is difficult for people that don’t have MS or Transverse Myelitis to understand what you are going through. This is a Neurological disorder and some of the symptoms cannot be seen on the surface. So others who do not understand what MS is may think there is nothing wrong with you. After I was diagnosed with MS and TM I thought back to things that have happened to me over the years and I can now link them to symptoms of these diseases. I was always misdiagnosed with something else or the Dr’s would tell me it was all in my head. Believe me now I wish it had all been in my head. After I was diagnosed with SPMS and TM I was looking online to find information about MS and TM and I had to go through tons of different websites and I thought this is crazy. So I decided instead of sitting there and pitying myself not doing anything I decided to start my own website. I gathered all of the websites I found about MS and TM and other information and posted it on the website to make it easier for other people to find this information. 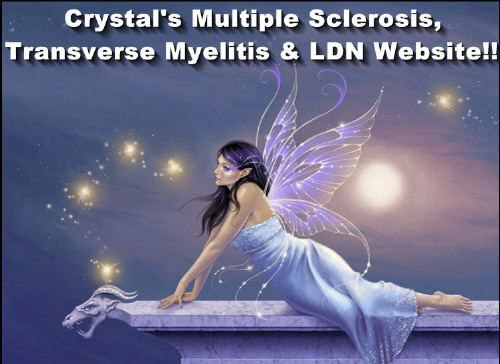 I started Crystal’s MS, TM and LDN Website in 2005. I also have an LDN_Users Yahoo Support Group for people that need support and information about LDN for all autoimmune diseases and cancers. April of 2010 me and my son moved to Phoenix, Arizona so we could be closer to my twin daughters and his sisters plus he wanted to go to school there so I up rooted myself to help him and moved there with him. I ended up meeting a guy in Arizona around the middle of June. We had made some what we thought were friends in the apartment complex we lived in and we all decided to rent a house together so it would be cheaper on all of us. We found a house and moved in around March 2011 and we were getting settled in then we found out our roommates were on some kind of drugs plus heavy prescription drugs and they were acting all weird and was hiding in their bedroom for like 2 days. We had made some what we thought were new friends and they got jealous of them and started acting like children saying stuff that wasn’t true but with them being on the drugs and freaking out no matter what you said made a difference. The couple we were living with started fighting everyday which got to be too stressful so me and my ex now decided to move. The night before we were to move we went to bed and were woken up out of a dead sleep by our roommates and some other people. I guess they had snuck out during the night and were freaking out about nothing but before they showed up she started calling me and telling me stuff that wasn’t true and was blowing things way out of proportion . I told her she was over reacting and I ended up hanging up on her and shut my phone off and went back to sleep. Then we heard a loud commotion that woke us up out of a dead sleep and my ex now opened our bedroom door to see what was going on and there were 2 other guys with our roommates and when my ex now opened the door they had an AK47 gun and knife to our faces to make us leave the house. We decided to let things cool down for a day or 2 and went and stayed with our new friends up the road. When we went back to get our stuff she had gotten rid or hid most all of our stuff and said she got rid of it. She had some other druggy people in the house and I went to the door asking for my roommate and the chick who answered the door said she wasn’t there. She asked who I was and I told her and told her I was there to get my stuff and she said you don’t have anything here and I was looking in the door and saw some of my stuff and I was like yes that, that and that is mine. I had the only lease and had keys to the house and went in to get what I saw and to see what I could find then the roommate came out of the bedroom with a knife at me. She started yelling saying she had us taken off the lease and had the other people move in and this was only in 2 days time. I told her she could do it the easy way or the hard way and she chose the hard way so I called the cops but that did no good. Even though I had the only copy of the lease and keys to the house the cops wouldn’t even let me in the house and said unless I had proof of what was mine I could only take what she gave me and I would have to take her to small claims court so we lost EVERYTHING even our clothes and thing’s I can never replace. I couldn’t believe the cops did nothing!! Phoenix is a messed up city and from what I saw the year I lived there was all people were out for was drugs and anything they could do or steal to get money to buy them. So Sad!! After waking up to an AK47 and knife to my face that’s all I saw for the weeks following every time I closed my eyes so it sent me into an MS flare. The first one I had in 7 years since being on LDN. I started going numb from my chest down to my feet again so I went to my Dr and got some steroid pills and snapped out of it. Thank God!! Anyway we ended up leaving Arizona and moved to Pennsylvania to be close to my ex’s family but that didn’t work out either. So needless to say we are not together anymore and I ended up having to move to Florida. I went for new MRI’s with and without contrast and everything came back great and even the Transverse Myelitis in my back was gone. All the Neurologists office mentioned was the 2 bulging disks in my neck from an accident I had a few years back. LDN has stopped my progression of my MS and TM. Most all my symptoms are gone and my MRI’s were clear so if that’s not proof LDN works then I don’t know what is. I’ll have to post my MRI reports online so everyone can see the difference. After I was diagnosed with SPMS and TM we were looking online to find information about MS and TM and we had to go through tons of different websites and I thought this is crazy. So I decided instead of sitting there and pitying myself not doing anything I decided to start my own website. I gathered all of the websites I found about MS and TM and other information and posted it on the website to make it easier for other people to find this information. I started Crystal’s MS,TM and LDN Website in 2005. I also have an LDN_Users Support Group for people that need support and information about LDN for all autoimmune diseases and cancers.